It seems like thousands of people get on the internet every day to shout their opinion at anyone who will listen or to shout back at those people who started the shouting in the first place. Why do they at all do that?? 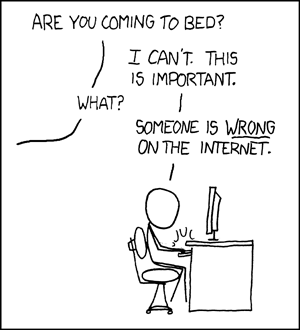 Obligatory xkcd comic on this one. It really doesn’t surprise me. People crave attention more than anything. It makes them feel important. Internet allows you to voice your opinion. People are desperate to be heard. Not many realize it. It gives them a sense of importance. I can not put it any better. What better place than internet to sport a mask? It can not get any easier. It is something deeper than the simple explanation I was trying to give. The gist remains the same. Ego. Not many realise how important it is to satisfy your desire to feel important. I can not stress it enough. I’d take the rather brave stance to state that satisfying your ego and asserting that you are important is the most important thing everyone must do. Why should you satisfy your ego? I’m afraid I can not answer it reasonably in a short post. My stance has got a lot to do with how I view the world, the good, the bad, the truth, the ideal, and the very purpose of life. My views are very much influenced by my choice. I chose to believe that it is a choice that makes all the difference. I’ll leave it at that and let you ponder. What is your view on Hedonism? Preface: I have started a game-of-sorts. AMA: Ask Me Anything. This week’s question by Utsav Bansal, and my answer follow. Whats your view on Hedonism? TL;DR: I am a Hedonist. Hedonism is a school of thought that argues that pleasure is the only intrinsic good. Why do I call myself a Hedonist? And why I believe you should be a hedonist, too. Good and Bad are relative. Anything that makes me happy is Good, anything that makes me sad is Bad. I am someone who believes that the world is a battleground. Ideals, ethics, and the like are an elaborate set of hopelessly foolish ideologies whose primary objective is to ensure the survival of group. Every individual likes to be happy, likes to live happily. With this premise, how do I explain the good samaritan who would sacrifice his life to save others’? How would I explain the man who held his ideals above everything else, even his own happiness? Every action has a cost and a value, different in every observer’s perspective. I believe that a person does something only when the percieved value exceeds the cost. Which means to get some work done out of an individual, all you have to do is either make him believe the result has a greater value, or it incurs a lesser cost in his or her perspective. A bank secures its perimeter with gaurds, fences, has a safe with thick metal doors, alarms, and multiple protection schemes. For my room, I use a lock that weighs a few grams on a aluminium handle that can be bent with ease. Why do I not have a dozen security systems guarding it? the question may seem ridiculous at first sight, but if you care to ponder, the simplest explanation happens to be the cost-value model. The bank sees a greater value in having all those security measures compared to the cost they incur, and I find the cost far higher than the value it provides. It also explains why a paranoid person might actually have a dozen security and alarm systems. That has a greater value in his view, great enough to offset the costs. A soldier fighting for his country sees a greater value in being a warrior for the country, than the cost of losing life. A man of ideals believes upholding his ideals has a greater value than his own pleasures. You get the point. I am someone who believes every action can be explained using the cost-value model. And to me, my own happiness has a value unmatched by anything else. I do go out of my way to help others, but the inconvinience in the process, I consider a lower cost than the value of seeing a bright, smiling face. I try to maximise the net pleasure. Yes, I am a Hedonist. Let us play a game. AMA. Ask Me Anything. Anyone can ask me anything. I will answer it seriously, true to the best of my knowledge. I reserve the right to not answer. I reserve the right to end the game or modify the rules without any prior notice. All answers to AMA questions will be posted on this blog under the category AMA. Update: I gave up, because of two reasons. One, All questions I get are philosophical in one way or the other. The fun game turned very demanding, time-wise. Two, I have not received many questions. I will still answer questions if I get any interesting ones, and I have time for that, but frequent updates should not be expected.